Spitfire VIII VH-HET returned to her previous home at Pay's for the Flight of the Hurricane air display. This aircraft was acquired by the late Col Pay in 1982/3 and almost immediately began an intensive rebuild at Scone NSW in what is now the Vintage Fighter Restorations Hangar. This was the first airworthy restoration of a Supermarine Spitfire Warbird in Australia and one of the first WWII fighter restorations in the country. The task was long and difficult because many of the parts which are common today were very scarce in those days. The Spitfire was completely dismantled and restored including the engine. The structure of the fuselage and wings required considerable rebuilding due to years spent outside in the elements but the end result was a very solid and largely original aircraft. The work progressed well despite the difficulties, and as those who knew him will attest – Col Pay was a very purposeful and determined man, and he certainly focused his skills and those of the team at Scone on completing the project. Success came on 29.12.85 when in the hands of Col, A58-758 took to the air again over Scone and as a testament to Pay’s skills it still flies today 35 years later and has been virtually incident free. This Spitfire was the last of a large number of Spitfires purchased for the RAAF. It was built at Chattis Hill (a Supermarine assembly/satellite factory), UK in 1945, constructed as a Spitfire HF.VIII S/N 581740, allocated the RAF serial MV239. It is recorded as crash landing on test flight at 6 MU 20/03/45, repaired and shipped to Australia arriving on 19/06/45 at which time it passed into various storage facilities including RAAF Richmond and never saw operational use (Brought on RAAF Charge 26.6.45 and Struck off Charge September 1949. Post War the Spitfire was disposed of and passed to Sydney Tech College in 1949 for use as an instructional airframe and remained crated outside at the college and was vandalized. The Rolls Royce Merlin 70 engine No. 184559, had been removed from the aircraft and was used to power a CAC Mustang. A58-758 then passed to A. J. R. "Titus" Oates, Sydney NSW in 1961 and was again stored before moving on again to Sid Marshall, Sydney-Bankstown NSW from 1963 until 1972. In 1972 the Spitfire was loaned to Camden Museum of Aviation NSW until 1982 and was restored to Taxiable condition in its RAF guise as MV239. In 1982 the Spitfire was acquired by the legendary Col Pay and began a 3 year rebuild to airworthy status at Col’s Scone base. 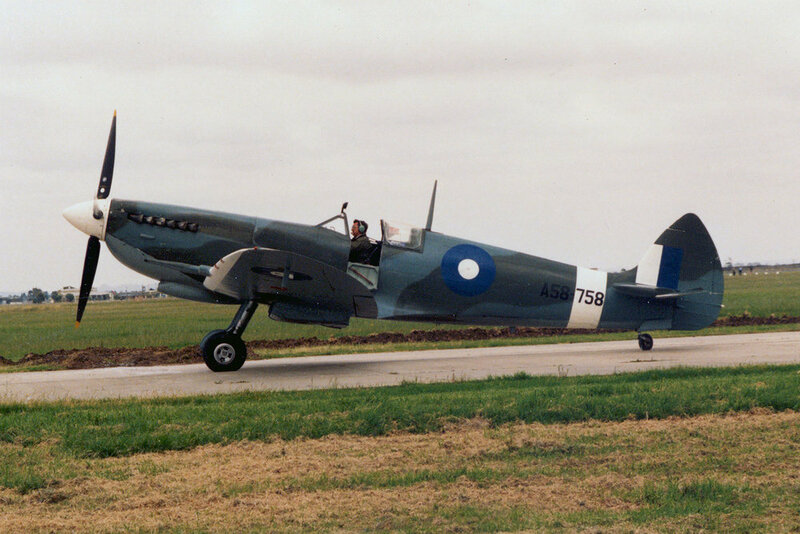 On 29.12.85 the Spitfire registered as VH-HET flew again with Col Pay, finished as A58-758. The Spitfire had been fitted with a Rolls Royce Merlin 68A from an ex-RAAF Avro Lincoln as the 70 series engine was deemed un-airworthy. The Spitfire continued for many years delighting crowds throughout Australia in Col’s expert hands and it was certainly not pampered. One particularly memorable event was the 1988 Bicentennial airshow where it put on a very spirited display in the hands of Col. In 2000 the Spitfire was acquired by David Lowy and repainted as A58-602, it is flown by Temora Aviation Museum NSW. The aircraft is finished in the green and grey camouflage colors worn by the RAAF aircraft defending Darwin during World War II and in operations in the South West Pacific. The aircraft carries the markings of Wing Commander R.H. (Bobby) Gibbes OAM DSO DFC*. Prior to his death in 2007 Bobby Gibbs was able to see both this color scheme , and his P40 desert scheme on Col Pay’s P40. The two aircraft have flown together on a couple of occasions since. This Spitfire flies as Australia’s greatest Warbird at numerous airshows and commemorations and represents not only those who flew the aircraft in Australia’s service but also as a testament to Australia’s great Warbird founders like Col Pay.